When I first heard about Ada Lovelace Day, I started thinking about who I’d write about. I figured the usual suspects like Grace Hopper were out, but that left the field wide open – there are so many cool women around in different fields. After discovering geometry, Sophie Germain taught herself mathematics, and also Latin and Greek so that she could read the classical mathematics texts. Her parents opposed her study and tried to stop it, so she studied at night. They took away candles and forbid nighttime fires, even taking her clothes away, all so that she could not read at night. Her response: she smuggled candles, she wrapped herself in her bedclothes. She still found ways to study. After Fermat, Germain embarked on an eventful career as a physicist, a discipline in which she would again excel only to be confronted by the prejudices of the establishment. Her most important contribution to the subject was “Memoir on the Vibrations of Elastic Plates,” a brilliantly insightful paper which was to lay the foundations for the modern theory of elasticity. It’s sad, not just on a personal level – imagine having that brain, that drive to collaborate and create, and not being taken seriously because of your gender – but can you imagine how much further the field of mathematics or physics might have advanced if she’d been supported and allowed to participate fully in the scientific community? I couldn’t find any images of Sophie Germain that I could clearly re-use, so instead you could go check out the range of faces tagged womensday on the Flickr Commons site, many of whom are scientists or inventors themselves. If I knew more about them I’d look for candidates for Modern Bluestocking. I’m really excited that we’ve managed to get some new pages and updated text about Ada Lovelace on the Science Museum website, and particularly that it’s in time for Ada Lovelace Day. On a personal note, I’m thrilled because ‘women in technology’ has long been an issue close to my heart. I think role models are important and I don’t know if you can get better than the woman often described as “the world’s first computer programmer”. It’s also exciting because it shows that with the right infrastructure, and institutional support, museums can move quickly (ish) and be responsive to current events. It couldn’t have happened without the support of the curatorial and marketing departments. The Computing gallery in the Science Museum has some great objects – Babbage’s Analytical Engine and the Difference Engine built by the Science Museum according to Babbage’s original specifications (and half ofBabbage’s brain in a jar). There are also performances by the Ada Lovelace drama character on Tuesday, March 24, so pop in if you’re in London. Speaking of Ada Lovelace Day, I’d better get my ALD09 blog post written tonight! If you’re not sure who to write about I’ve posted about possible candidates under the label AdaLovelaceDay09. Three percent of tenured professors of physics in this country are women. Nonetheless, a woman physicist stopped light in her lab at Harvard. Another woman runs the linear accelerator at Stanford. A woman discovered the first evidence for dark matter. A woman found the top quark. The list doesn’t stop there, but the point is clear. Three years ago, Discover started a project to look into the question of how women fare in science. We knew there were large numbers of female researchers doing remarkable work, and we asked associate editor Kathy A. Svitil to talk to them. The result of her investigation is a selection of 50 of the most extraordinary women across all the sciences. Their achievements are detailed in the pages that follow. To read their stories is to understand how important it is that the barriers facing women in science be broken down as quickly and entirely as possible. If just one of these women had gotten fed up and quit—as many do—the history of science would have been impoverished. Even the women who have stuck with it, even those who have succeeded spectacularly, still report that being a woman in this intensely male world is, at best, challenging and, at worst, downright disheartening. It will take goodwill and hard work to make science a good choice for a woman, but it is an effort at which we cannot afford to fail. The next Einstein or the next Pasteur may be alive right now—and she might be thinking it’s not worth the hassle. NEW YORK, March 10, 2009 – ACM, the Association for Computing Machinery, has named Barbara Liskov of the Massachusetts Institute of Technology (MIT) the winner of the 2008 ACM A.M. Turing Award. The award cites Liskov for her foundational innovations to designing and building the pervasive computer system designs that power daily life. Her achievements in programming language design have made software more reliable and easier to maintain. They are now the basis of every important programming language since 1975, including Ada, C++, Java, and C#. The Turing Award, widely considered the “Nobel Prize in Computing,” is named for the British mathematician Alan M. Turing. The award carries a $250,000 prize, with financial support provided by Intel Corporation and Google Inc. The first woman to be awarded a Ph.D. from a Computer Science department (in 1968 from Stanford University), Liskov revolutionized the programming field with groundbreaking research that underpins virtually every modern computer application for both consumers and businesses. Her contributions have led to fundamental changes in building the computer software programs that form the infrastructure of our information-based society. Her legacy has made software systems more accessible, reliable, and secure 24/7. One of the prototypes made for dev8D has been adapted so it can ‘splash a big QR code onto the screen‘ so people can conferences can take a shot of it and click straight through to the URL – no typing. Super cool! I’m excited by Semapedia, a project “which uses QR Code nodes to connect Wikipedia articles with their relevant place in physical space”. You can browse locations that have been tagged on a map or on Flickr. I get excited by things like this because it makes ‘outside the walls of the museum‘ projects seem much more feasible. The ZKM (Centre for Art and Media, Karlsruhe) are exploring mobile tagging for their 20th anniversay: “[w]ith this new tag solution, you can communicate with the museum and use it as a platform also outside of opening hours, i.e., not bound to a certain time, and without being physically present in the museum, i.e., not bound to a certain place.” The site is in German so it’s difficult to work out exactly what you get online. Thanks to Jennifer Trant for the tip-off. Two notes on QR tags out in the wild – Seb’s recent post linked to ‘a guerilla art installation at [Melbourne’s] Federation Square‘ which is ace on so many levels. I love their ethos. 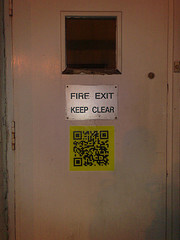 The image is a photo I took today – a band have put up a QR tag outside a London tube station. It takes you to a page that links to a downloadable track and their iTunes and MySpace pages. Tragically, I’ve even started using QR codes in the office – I often use my phone to test sites outside our network, and I’ve printed out a sheet of QR codes for sites I check often, to save typing in URLs on my phone keyboard. These are my very rough notes on Grahame Klyne‘s talk on Agile Development as JISC’s dev8D event in February. Grahame works with bioinformatics and the semantic web at the zoology department of Oxford University. He is interested in how people can make useful things out of semantic web technologies. Any mistakes are mine, obviously, and any comments or corrections are welcome. (I should warn that they’re still rough, even though it’s taken me a month to get them online.) My notes in [square brackets] below. He started by asking people in the room to introduce themselves, which was a nice idea as most people hadn’t met. They had real users, and wanted to apply semantic web technologies to help them do their research. At the start of the project, all the developers went on week-long training course on agile development, which was really important for the smooth running of the project as they all came out with a common view on how they might go forward. Everyone worked with ‘how can we make this work best for us’ view of agile development. Agile – what’s it about? Agile values individuals and interactions over processes and tools. It values responding to change over following a plan – this is particularly interesting when writing proposals for funders like JISC. From a personal perspective, the key principles became: what we do is (end) user led; spend a lot of time communicating; build on existing working system code (i.e. value code over documentation); develop incrementally. It’s not in all the textbooks but they found it’s important – they ‘retrospect’. User-led: you need a real user as a starting point. Not sure how to advise someone working on a project without real users [I didn’t ask, but why would you be doing a project without a real users?]. It’s far easier to elicit requirements from user if you have a working system. Building on working code: start with something simple that works. Build in small steps – it’s easy to say, but the discipline of forcing yourself to take tiny steps is quite hard. The temptation is to cram in a bit more functionality and think you’ll sort it out later. When you get used to the discipline of small steps, it gets so much easier to maintain flow of development. Minimise periods of time when you don’t have working system. Always look for easy ways of implementing what you need to do now. Don’t bring in more complex solution because you think you might need it later. Retrospection – ‘the one indispensable practice of agile’? As a team, take time regularly to review and adjust. Keep refactoring separate from the addition of new functionality. Card planning: for e.g. user stories, tasks. It’s a good solution in an environment with very strong characters, it allows everyone to be confident that their input was being noted, which means they don’t hijack the session to make sure their points have been heard… the team can then review and decide which are most important in next small block of work. Outcomes: progress had been steady and continuous rather than meteoric. What seems like a slow pace at the time actually gets you quite far. It produces a sense of continuous progress. Never refactor until you have to. Don’t make stuff you *might* need, make it when you need it.